You’ve heard about all the wonderful reasons to visit Asheville, read about it on every “Best Places” list, seen your friends post pictures about the things to do in Asheville. What you probably haven’t seen pop up on their social media posts are all the sites in Chimney Rock and Lake Lure. Despite the area’s growing popularity as an outdoor haven and its propensity to show up in feature films (most notably Dirty Dancing), these towns are sometimes missed by visitors. Just an hour southeast of Asheville, Chimney Rock and Lake Lure offer visitors everything they should be looking for in a mountain getaway. The 25-mile drive from Asheville is a slow, winding drive up and down steep hills and sharp switchbacks. If you’re traveling from Black Mountain, Highway 9 is an even more adventurous journey, but well worth the drive (stop off for a quick bite at The Straightaway Cafe and enjoy delicious food and live music). workout in and take the 500 steps to the top or save yourself the sore muscles and ride the elevator. At the top you’ll find breathtaking, long-range views of Lake Lure, Hickory Nut Gorge, and Chimney Rock Village below. Once you’re done ogling the views, continue your hike over to Hickory Nut Falls, one of the highest waterfalls east of the Mississippi. The trail to the lower falls is an easy to moderate hike, while the trail to the upper falls is much more challenging. Full of charm and hospitality, Chimney Rock Village is an iconic mountain town with close to 40 shops and restaurants to explore. Step back in time at Bubba O’Leary’s General Store where you’ll find everything from classic candies and glass bottle Cokes to Chimney Rock souvenirs and outdoor equipment. Looking for something one of a kind? Shop Natives Rest Candle Shop and Local Goods for handmade soaps, candles, and jewelry. John Bull Trading Company and Willow Creek, also on the main strip, have unique gifts and souvenirs. Once you’ve finished shopping, enjoy a relaxing walk along the Rocky Broad Riverwalk or take in a game of putt-putt at Chimney Rock Adventure Golf. For foodies, Chimney Rock won’t disappoint. 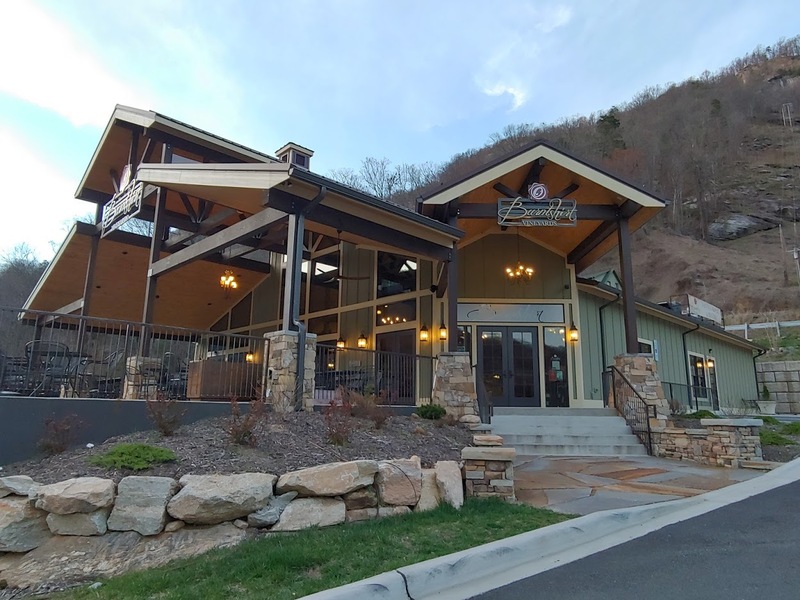 Medina’s Village Bistro is an excellent spot for a delicious brunch (order the cinnamon roll and thank us later) and patio views of Chimney Rock and Hickory Nut Falls. Directly on the river is Riverwatch Bar and Grill, known for their specialty burgers, riverfront seating, and ice cold beer. Burntshirt Vineyards Tasting Room and Bistro is new to Chimney Rock and has an incredible selection of award-winning wines, including their signature Apple Wine. Across the street from Burntshirt is Hickory Nut Gorge Brewery, serving local craft brews from locally sourced ingredients. They feature a daily rotation of English ales, IPAs, seasonal wheats, and guest taps from the Asheville area. required). Schedule a tee time at one of Lake Lure’s outstanding golf courses, such as Rumbling Bald Resort’s Apple Valley and Bald Mountain courses or the Lake Lure Golf Club. Stroll the Lake Lure Flowering Bridge, a historic 155-foot long and 20- foot wide bridge now adorned with a colorful display of seasonal flowers and plants. 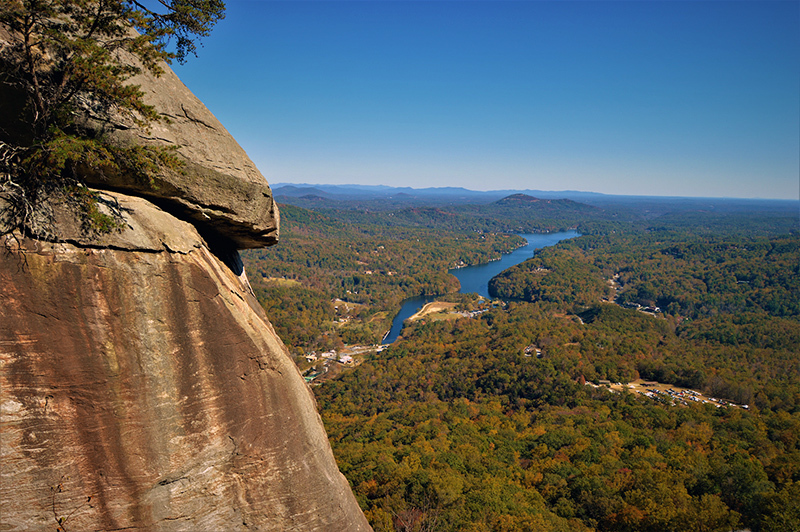 From the bridge, you can enjoy views of Chimney Rock, Rumbling Bald. and Lake Lure. Rumbling Bald Climbing Access, part of Chimney Rock State Park, is located in Lake Lure and free to access (different than the main Chimney Rock Park access which does charge a fee). The Rumbling Bald Hiking Trail is a 1.5-mile loop through the woods, up to massive boulders and staggering cliff ledges. This area is a climber’s dream, as it features some of the best rock climbing and bouldering in Western North Carolina. Ready to make all your friends and family #instajealous? 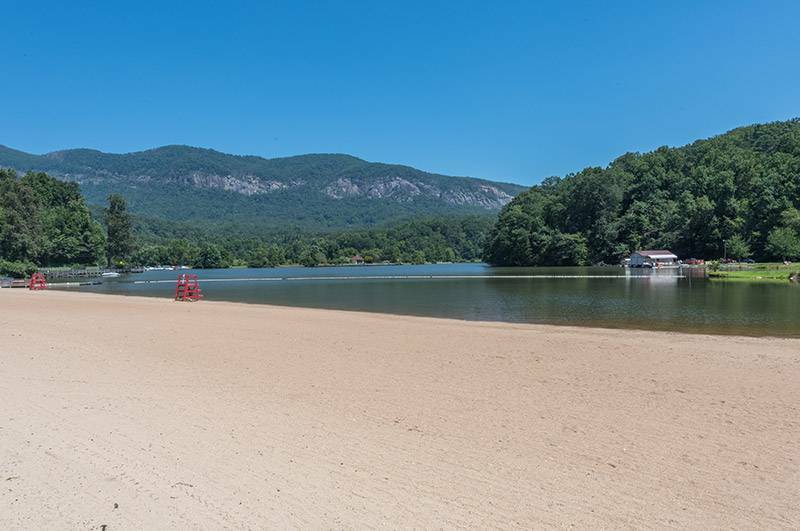 Check out Greybeard’s Lake Lure area rentals and get ready to have an adventure of a lifetime.